In last night's State of the Union address, President Trump repeated his request that Congress produce a bill that provides an amnesty for 1.8 million illegal aliens with a 10- to 12-year path to citizenship in exchange for some of its border security and immigration enforcement wish list and reductions to chain migration. This is an analysis of the legal immigration provisions in the White House Framework. Under the plan, there would be an instant amnesty for an estimated 1.8 million "DACA-eligible" illegal aliens. To offset the number of new green cards, President Trump proposes to end the largest chain migration category (parents of naturalized citizens) right away and make further cuts to chain migration after those currently in line for other categories have been admitted. The bottom line is that these cuts to chain migration would reduce total legal immigration by about 18 percent in the short term, and 33 percent in the long term (after 10 years). However, the huge size of the amnesty means that under this scheme it will take about 15 years for the chain migration cuts to offset the new green cards awarded in the amnesty. In other words, there would be instant deportation relief for 1.8 million illegal aliens, but a very long wait for immigration relief for Americans. Immediate amnesty for 1.8 million "DACA-eligible" illegal aliens. 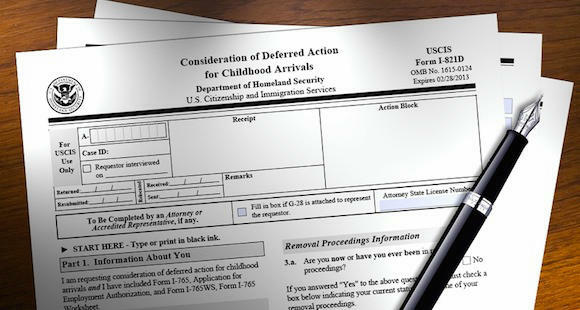 This group is meant to include both DACA recipients and those who meet the age and arrival requirements, but who may not have ever actually applied, who may have been too young at the time (DACA beneficiaries had to be at least 15 because technically they were applying for a work permit), or who were ineligible because they dropped out of high school. 10-year path to citizenship. Amnesty recipients will have a five-year period of conditional residence and may adjust to Lawful Permanent Residence (LPR, or green card) status after meeting certain benchmarks, such as minimal work or educational requirements. Notably, they will have to meet the "Good Moral Character" standard, which is the standard for receiving a green card under current law; DACA held applicants to a lesser standard that allowed certain types of criminal behavior. They may become citizens after another five to seven years. Reduce chain migration categories. Immigrants will be able to petition only for new spouses and children under the age of 18 (reduced from 21 under current law). The spouses of citizens (and their children) will continue to enter in unlimited numbers and the spouses of LPRs (and their children) will be capped at about 88,000, as under current law. The categories for adult sons and daughters, siblings, and parents of citizens will be eliminated. Admit the chain migration waiting list. All of the approximately 3.9 million people on the waiting list for chain migration green cards will be offered the opportunity to apply for admission under current numerical limits, plus a few extra (see below). According to the State Department, this will ultimately result in the admission of about 2.5 million new immigrants, as some will decline the opportunity and a few will be found to be ineligible for admission. I estimate that the admission of these applicants would take approximately 10 years under the current numerical limits and quotas. End the visa lottery. The 50,000 immigrant visas now allotted to the visa lottery will be re-allocated and divided equally between the family and employment category waiting lists. The chain migration reductions are long overdue and will put a brake on the continuous growth in family-based immigration that has led to labor market distortions and burgeoning fiscal costs. However, as the table below shows, because many of the cuts are postponed until after the admission of the waiting list, the impact of the amnesty is not fully offset until about 15 years after the amnesty occurs. I estimate that under the president's proposal, annual green card awards would be reduced by about 18 percent in the first year. After five years, when the amnesty beneficiaries begin receiving green cards, the numbers would be far greater than current levels. After 10 years, green card awards would settle to a number that is about 33 percent lower than current levels, or about 775,000 per year. Part of the reduction comes from the change in the definition of "child". Under the president's proposal, only those children under the age of 18 (as opposed to the current age of 21) would be eligible for admission — in all categories, including family, employment, and humanitarian categories. According to DHS statistics, there are about 52,000 annual admissions of young adults aged 18-20 years. I estimate that this would result in a permanent decrease of about 26,000 admissions in the categories for U.S. citizen's spouses and children, refugees, and miscellaneous other categories. In addition, I estimate that the new definition would free up about 26,000 additional visa numbers annually in the numerically limited family and employment categories, which would help accelerate the draw-down of the waiting list. In sum, the president's proposal offers an extremely generous amnesty for the so-called Dreamers paired with gradual but substantial cuts to chain migration, resulting in a modest decrease in overall legal immigration after 10 years. My colleague, Art Arthur, has analyzed the border security elements of the President’s Framework. * These numbers are not subject to strict limits and fluctuate from year to year.